Women who juggle the consuming demands of career, family and home want to take better care of themselves and have fulfilling relationships, but often don’t know how, despite reading many self-improvement books. They seem conflicted between meeting the external demands of life and overcoming an internal voice that prevents them from being kind to themselves. 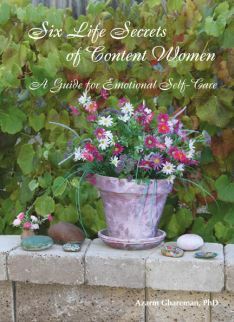 Six Life Secrets of Content Women: A Guide for Emotional Self-Care answers the plight of thousands of women by teaching them how to take care of themselves emotionally. It helps them identify blocks that prevent them from releasing their full kindness into their own lives. This book, written in a simple language, is a guide that shows women six areas where their emotional energy is being drained in their lives. It offers women a template for simple, authentic living that leads to contentment as they re-invest more of their energy in themselves; become able to achieve more of what they want, and eventually become more content. Six Life Secrets of Content Women shifts the focus to the woman herself and encourages her to take care of herself first, especially emotionally. It stresses the importance of contentment rather than happiness. Taking care of ourselves goes beyond manicures and massages. It is about learning to set clear but flexible boundaries; stopping the loss of emotional energy, and making ourselves a priority without becoming cold and selfish in the process. It is the joyful discovery of giving to ourselves and to others. Listen to a conversation with the host of New Dimensions Radio (on NPR), Justine Willis Toms, aired in July 2011. Search the archives under author’s name. Read a brief review of the book in Mystic Living Today. Place an order for printed books on our Purchasing page. New! You can buy the eBook version (Includes .mobi for the Kindle readers and .ePub for just about anything else). Introductory price is only $4.82 USD! No shipping charges, and download as soon as your order is cleared. Azarm Ghareman, PhD, is a Clinical Psychologist with special training in Depth Psychology. She has a private practice in San Luis Obispo, CA, conducts workshops and does consulting on cultural and women's and men's issues. Six Life Secrets of Content Women is her most recent publication. Buy any two books and receive free domestic shipping. Copyright © 2019 Azarm Ghareman. Site by Fire and Motion.